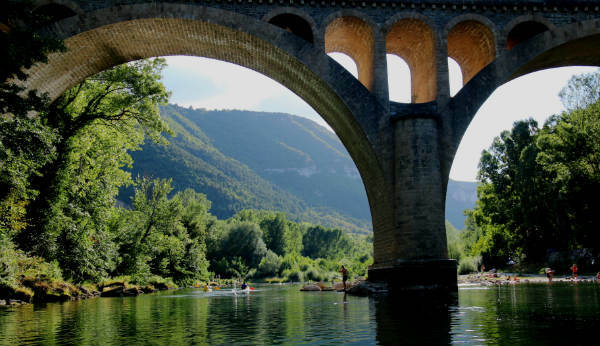 Heading south for more water adventures, mountain scenery and abundant wildlife, the Millau viaduct is the gateway to reach the high limestone plateaux of the spectacular Gorges du Tarn, known as Les Causses and labeled a UNESCO world heritage site. 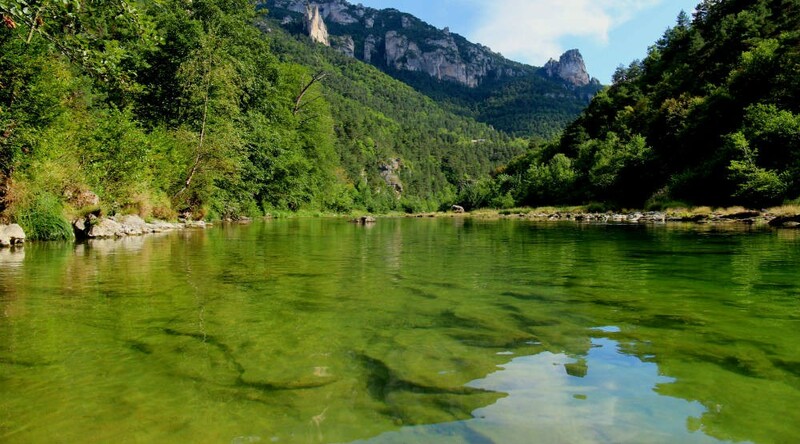 We ventured to the most exciting and attractive section of the Tarn River, which runs north of the pretty little village of Rozier, 21 km northeast of Millau along a twisting road at the foot of one of the longest and deepest gorges in Europe. The narrow scenic road follows the left bank of the river up to Les Vignes, a tiny village perched over an ideal departure point on the river, equipped with an inviting water toboggan. Both sides of the river are spiked with pinnacles of sheer eroded rocks and cloaked with woods of feathery pine. The steep environment sets scales into perspective, from my cosy embarkation the grandeur of the precipitous trench is impossible to capture on camera, the majestic landscapes difficult to compact to fit in a lens. About a kilometre downstream, rapids start splashing. Nothing too impressive for Seahawk, riding rapids on an inflatable embarkation is fun, safe and bouncy. Paddling an inflatable is nothing like paddling a kayak. It is smooth, gentle and reactive. Your faith lies more in the drifting current than in your paddling skills and that allows you to focus on onboard entertainment and conviviality. This is a distinct “non-sporty” rafting experience you can quickly get addicted to and a perfect escape on a hot summer day. Floating brings your awareness into the present moment and awakens the senses. Life slows down. Everyone has a personal preference when it comes to crew navigation techniques on the river. I’m a big fan of rowing in turns. Team collaboration somehow reaches its limits and sharing the task with one paddle each is bound to stimulate divergences in rhythm and strategy, to create tensions and could easily ruin a relationship. My tip is to let your part-time co-sailor paddle as you offer to spread the local tapenade or foie-gras on a piece of crispy baguette and quench our thirst with a fruity rosé…. Team work it is in the end!